“A list is only as strong as its weakest link” – Donald Knuth. 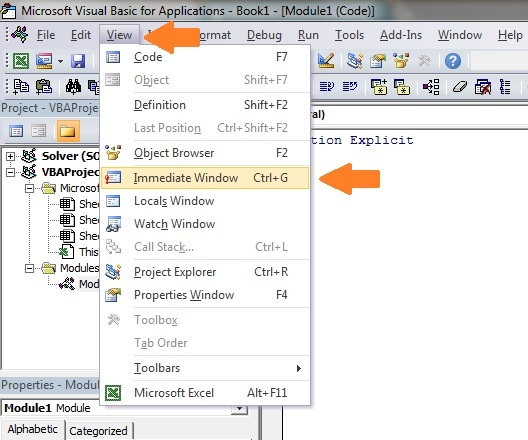 The following table provides a quick reference to using arrays in VBA. 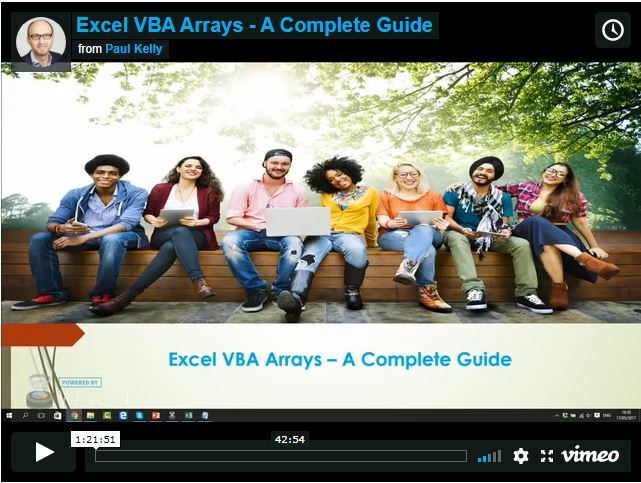 The remainder of the post provides the most complete guide you will find on the VBA arrays. 6 What are Arrays and Why do You Need Them? In the first section we will look at is what are arrays and why you need them. You may not understand some of the code in the first section. This is fine. I will be breaking it all down into simple terms in the following sections of the post. If you are a member of the website, click on the image below to access the webinar. Please click on the button below to get the fully documented source code for this article. Sometimes Collections are a better option than arrays. You can read about collections here. Arrays and Loops go hand in hand. The most common loops you use with arrays are the For Loop and the For Each Loop(read-only). What are Arrays and Why do You Need Them? A VBA array is a type of variable. It is used to store lists of data of the same type. An example would be storing a list of countries or a list of weekly totals. In VBA a normal variable can store only one value at a time. The following example shows a variable being used to store the marks of a student. If we wish to store the marks of another student then we need to create a second variable. We are going to read these marks and write them to the Immediate Window.
' Get the worksheet called "Marks"
The problem with using one variable per student is that you need to add code for each student. Therefore if you had a thousand students in the above example you would need three thousand lines of code! Luckily we have arrays to make our life easier. Arrays allow us to store a list of data items in one structure.
' Offset counts rows from cell C2. The advantage of this code is that it will work for any number of students. If we have to change this code to deal with 1000 students we only need to change the (1 To 5) to (1 To 1000) in the declaration. In the prior example we would need to add approximately five thousand lines of code. As you can see, using variables and arrays is quite similar. The fact that arrays use an index(also called a subscript) to access each item is important. It means we can easily access all the items in an array using a For Loop. Now that you have some background on why arrays are useful lets go through them step by step. Static – an array of fixed size. Dynamic – an array where the size is set at run time. The difference between these arrays mainly in how they are created. Accessing values in both array types is exactly the same. In the following sections we will cover both types. As you can see the size is specified when you declare a static array. The problem with this is that you can never be sure in advance the size you need. Each time you run the Macro you may have different size requirements. If you do not use all the array locations then the resources are being wasted. If you need more locations you can use ReDim but this is essentially creating a new static array. The dynamic array is not allocated until you use the ReDim statement. The advantage is you can wait until you know the number of items before setting the array size. With a static array you have to give the size up front. To give an example. Imagine you were reading worksheets of student marks. With a dynamic array you can count the students on the worksheet and set an array to that size. With a static array you must set the size to the largest possible number of students. 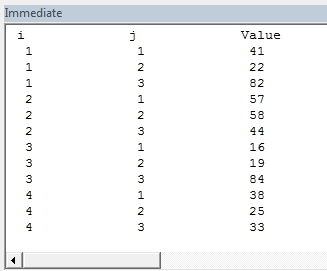 To assign values to an array you use the number of the location. You assign the value for both array types the same way. The number of the location is called the subscript or index. The last line in the example will give a “Subscript out of Range” error as there is no location 4 in the array example. You can use the Array function to populate an array with a list of items. You must declare the array as a type Variant. The following code shows you how to use this function. The array created by the Array Function will start at index zero unless you use Option Base 1 at the top of your module. Then it will start at index one. In programming it is generally considered poor practice to have your actual data in the code. However sometimes it is useful when you need to test some code quickly. The Split function is used to split a string into an array based on a delimiter. A delimiter is a character such as a comma or space that separates the items. The following code will split the string into an array of three elements. The Split function is normally used when you read from a comma separated file or another source that provides a list of items separated by the same character. Using a For Loop allows quick access to all items in an array. This is where the power of using arrays becomes apparent. We can read arrays with ten values or ten thousand values using the same few lines of code. There are two functions in VBA called LBound and UBound. These functions return the smallest and largest subscript in an array. In an array arrMarks(0 to 3) the LBound will return 0 and UBound will return 3. The following example assigns random numbers to an array using a loop. It then prints out these numbers using a second loop. The functions LBound and UBound are very useful. Using them means our loops will work correctly with any array size. The real benefit is that if the size of the array changes we do not have to change the code for printing the values. A loop will work for an array of any size as long as you use these functions. You can use the For Each loop with arrays. The important thing to keep in mind is that it is Read-Only. This means that you cannot change the value in the array. In the following code the value of mark changes but it does not change the value in the array. The For Each is loop is fine to use for reading an array. It is neater to write especially for a Two-Dimensional array as we will see. The Erase function can be used on arrays but performs differently depending on the array type. For a static Array the Erase function resets all the values to the default. If the array is of integers then all the values are set to zero. If the array is of strings then all the strings are set to “” and so on. For a Dynamic Array the Erase function DeAllocates memory. That is, it deletes the array. If you want to use it again you must use ReDim to Allocate memory. Lets have a look an example for the static array. This example is the same as the ArrayLoops example in the last section with one difference – we use Erase after setting the values. When the value are printed out they will all be zero. We will now try the same example with a dynamic. After we use Erase all the locations in the array have been deleted. We need to use ReDim if we wish to use the array again. If we try to access members of this array we will get a “Subscript out of Range” error.
' arrMarks is now deallocated. No locations exist. If we use ReDim on an existing array, then the array and its contents will be deleted. In the following example, the second ReDim statement will create a completely new array. The original array and its contents will be deleted. If we want to extend the size of an array without losing the contents, we can use the Preserve keyword. When we use Redim Preserve the new array must start at the same starting dimension e.g. We cannot Preserve from (0 to 2) to (1 to 3) or to (2 to 10) as they are different starting dimensions. In the following code we create an array using ReDim and then fill the array with types of fruit. We then use Preserve to extend the size of the array so we don’t lose the original contents. You can see from the screenshots below, that the original contents of the array have been “Preserved”. Word of Caution: In most cases you shouldn’t need to resize an array like we have done in this section. If you are resizing an array multiple times then you many want to considering using a Collection. Preserve only works with the upper bound of an array. If we try to use Preserve on a lower bound we will get the “Subscript out of range” error. When we read from a range to an array, it automatically creates a two dimensional array, even if we have only one column. There is no function in VBA for sorting an array. We can sort the worksheet cells but this could be slow if there is a lot of data. The QuickSort function below can be used to sort an array. Sometimes you will need to pass an array to a procedure. You declare the parameter using parenthesis similar to how you declare a dynamic array. Passing to the procedure using ByRef means you are passing a reference of the array. So if you change the array in the procedure it will be changed when you return. Note: When you use an array as a parameter it cannot use ByVal, it must use ByRef. You can pass the array using ByVal making the parameter a variant. It is important to keep the following in mind. If you want to change an existing array in a procedure then you should pass it as a parameter using ByRef(see last section). You do not need to return the array from the procedure. The main reason for returning an array is when you use the procedure to create a new one. In this case you assign the return array to an array in the caller. This array cannot be already allocated. In other words you must use a dynamic array that has not been allocated. The arrays we have been looking at so far have been one dimensional arrays. This means the arrays are one list of items. A two dimensional array is essentially a list of lists. If you think of a single spreadsheet row as a single dimension then more than one column is two dimensional. In fact a spreadsheet is the equivalent of a 2 dimensional array. It has two dimensions – rows and columns. One small thing to note is that Excel treats a one-dimensional array as a row if you write it to a spreadsheet. In other words, the array arr(1 to 5) is equivalent to arr(1 to 1, 1 to 5) when writing values to the spreadsheet. The following image shows two groups of data. The first is a one dimensional layout and the second is two dimensional. 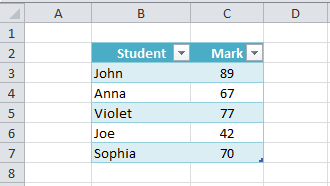 To access an item in the first set of data(1 dimensional) all you need to do is give the row e.g. 1,2, 3 or 4. For the second set of data (two-dimensional) you need to give the row AND the column. So you can think of 1 dimensional being multiple columns and one row and two-dimensional as being multiple rows and multiple columns. Note: It is possible to have more than two dimensions in an array. It is rarely required. If you are solving a problem using a 3+ dimensional array then there probably is a better way to do it. The following example creates a random value for each item in the array and the prints the values to the Immediate Window. You can see that we use a second For loop inside the first loop to access all the items. You may notice that LBound and UBound have a second argument of 2. This specifies that it is the upper or lower bound of the second dimension. That is the start and end location for j. The default value 1 which is why we do not need to specify it for the i loop. Using a For Each is neater to use when reading from an array. Using the For Each loop gives us the array in one order only – from LBound to UBound. Most of the time this is all you need. The dynamic array created in this example will be a two dimensional array. 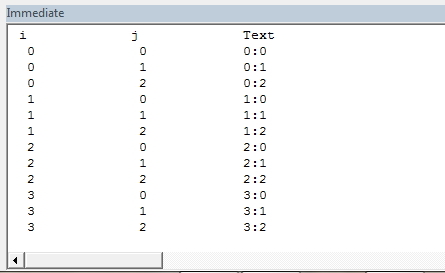 As you can see we can read from an entire range of cells to an array in just one line. The next example will read the sample student data below from C3:E6 of Sheet1 and print them to the Immediate Window. As you can see the first dimension(accessed using i) of the array is a row and the second is a column. To demonstrate this take a look at the value 44 in E4 of the sample data. This value is in row 2 column 3 of our data. You can see that 44 is stored in the array at StudentMarks(2,3). Updating values in arrays is exponentially faster than updating values in cells. 1. Copy the data from the cells to an array. 2. Change the data in the array. 3. Copy the updated data from the array back to the cells. Arrays are an efficient way of storing a list of items of the same type. 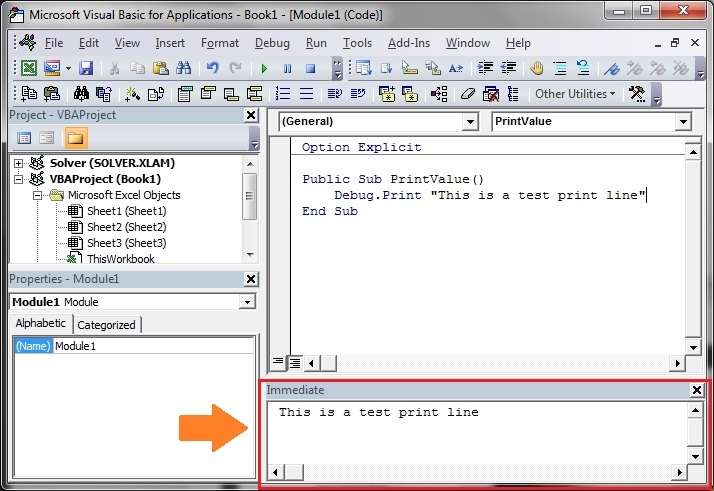 You can access an array item directly using the number of the location which is known as the subscript or index. The common error “Subscript out of Range” is caused by accessing a location that does not exist. There are two types of arrays: Static and Dynamic. Static is used when the size of the array is always the same. Dynamic arrays allow you to determine the size of an array at run time. LBound and UBound provide a safe way of find the smallest and largest subscripts of the array. The basic array is one dimensional. You can also have multi dimensional arrays. You can only pass an array to a procedure using ByRef. You do this like this: ByRef arr() as long. You can return an array from a function but the array, it is assigned to, must not be currently allocated. A worksheet with its rows and columns is essentially a two dimensional array. You can read directly from a worksheet range into a two dimensional array in just one line of code. You can also write from a two dimensional array to a range in just one line of code. how can i Loop over two arrays simultaneously and sort them for two groups? Why do you need to loop through them simultaneously? Why not just loop through one and then the other. Is it possible to export multiple sheet ranges into one pdf? example : arr = range(“A1:A4”) … which is not convenient for further operations. Is it possible to copy only 1 dimension into a new a array without looping on each item ? You’re talking about “slicing” an array. See the answers here with the highest votes. B) what is the difference between this state and the state when the array is declared. UBound should never be -1 unless the array was defined as something like arr(-5 to -1). I can’t think of any reason to do this. Hello! Excellent article Mr Kelly. I built an array by using your method. I have a question. For instance, I have this : location 1 : R; 2 : nothing; 3 : nothing; 4 : R. I have four locations and two R’s. Is it possible to know with an array function that is the second R has been suppressed? The result should be two. Thank you! You can use the worksheet.Count function for any overall total of items. Otherwise you have to check the array locations individually. It’s possible. You need to use the Outlook VBA library to create the buttons in an email. There is nothing like this in VBA. If you want to remove elements you are better off using a collection. To remove elements from an array is not simple. You need to create a new array and copy elements there. Thanks for the article. I have a problem with arrays. I am going to search 1 spreadsheet for the values in the other spreadsheet and do something when data are found. I don’t use vlookup function because it is very slow. UpdateRange array is very big (over 5000 cells sometimes) and it takes quite a long time to search it. However I need to search only last 1000 of cells/objects, but I have no idea how to write the code for that. ~ All 8 steps are used. I have no clue how to solve this with VBA. I tried to solve it by calculating steps from the starting number, solution and sub-solution, but stopped after 325 different calculations. Do you know a method to solve this problem? I have one of those questions. to load a huge sheet into an array. It is insanely fast. What I would like to do is a MATCH. IF this worked, I could avoid using a script.dictionary. IS there any method/function/way to do this?? Alternatively, is there a way to bulk load a script.dictionary? But loading 1,000,000 rows into the dictionary took 10 minutes. For that Want of a REAL hash table method. it is funny how many different things that we try FIRST until we give up and then post a question. I will have to dig into HastTable object to see what its performance is like. Using Script.Dictionary, is suffers greatly while adding a million keys. Your tutorials are quite clean and lucid for even a beginner. They create interest and help to understand the topic. Thank you very much for the good work and providing it for free. I have a big array with values, i read from different files, then i dump it int a “master-file”. Now: I want to update those values. How schould i do this more efficently? I can’t think of any easier way that checking each value individually. There may be some way to do it using bit operations but there isn’t a simple way. where Range(“E2”) is a number that can change. But Vba gave me an error cause it wants a costant instead of “nclassi-1”. Note that the first Dim isn’t required but it is good practice to include it. Thanks! Now it works! Otherwise it gave me an error! And thanks for your guides. Can you change your main image on this page?!?? 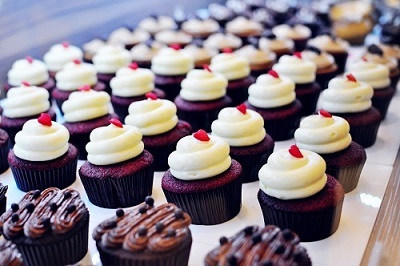 Your site is coming up frequently in my array syntax searches, and I always end up going to the bakery and += 2000 calories after I find what i’m looking for! Thanks! Hi Paul, congratulations on the excellent article. the best I’ve read about the subject. I have a macro that is building an array. The array has 400 columns and 1000 rows. I need outliers identified from each data column, not the total data cloud. I have to post the data in the worksheet first and then do the calculation. I’m using the code below. The code calculates the values in the worksheet. But it takes too long to calculate. I need to speed up the code, but I can not find the correct syntax. I’d like to first calculate in the array and then throw them in the worksheet. Is it possible? Thank you for your support. You can read from the range to the array. Perform the calculations in the array and then write the array back to the range. See section Reading from a Range of Cells to an Array. Your tutorial on arrays has been very helpful for my limited skill level. This code below works without error however my row count for the application can get upwards of 300,000 which i find takes about 6 secs to compete. This is by far will better than i had previously but in an effort to optimize further might you have any suggestions on how i might make this more efficient? Thank you in advance. ….snippet where most all the work is done…..
SecondsElapsed = Round(Timer – startime, 2) ‘my timer to test code speed. My below code works in row 2 only. Is there a way for the same logic to be be applied to rows 3-5000 without having to copy and paste the IF/Thens an change the row numbers? How do you program a macro to read an array’s value? Use a For Loop to read through each row. Student1 = .Cells(1, 1) /////in stead of .cells(1,1).value2 is it the same ? Students(1) = .Cells(1, 1) /////in stead of .cells(1,1).value2 is it the same ? if .value2 is neglectable , then will it faster to neglect it? It defaults to Value in most cases if it is not used. Value2 is faster and more reliable. Hi. First of all, Thank you for this detailed explanation. Based on the idea of using ‘For Each’ Loop on an Array I created a function, where the Array contains the list of all the cells I want to perform a specific procedure. However, when I run the code, some of the cells are skipped. While I confirmed that the array itself contains the cell ranges, the function seems to skip them. COuld you please help me with this problem ? what is wrong in the code. I wish to print the contents of the array. The array is a 2D array that starts at 1,1. Debug.Print myary(1,1) to print the first item. See loop to print all the items. 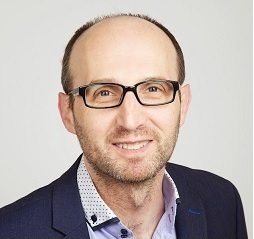 Hello Paul, and thanks for such a comprehensive coverage of VBA arrays in Excel. I’ve read through most of the document but have a few queries. You cannot use ReDim on static arrays. You *can* reduce the UBound of the final dimension with Preserve. The relevant values are discarded. The example uses Preserve on the *upper* bound of the first dimension (which is also illegal). ‘Using the For Each loop gives us the array in the order from LBound to UBound working from the last dimension to the first dimension’. Thanks again for such good coverage. I’m looking forward to reading your other topics. Hi, what would be a fast way to read data from A1:A10 range into 1D variable. Is it possible to read it first into 2D array – MyArr=Range(“A1:A10”).Value – an then somehow slash one dimension? You can use Application.WorksheetFunction.Index() to copy a row or column from an array. See example here. Keep in mind that it’s a very slow method. The difficult part is that instead of i and j, I have two vectors sitting right outside my array of values: i is equal to the letters A through F in a 6×1 array and j is a 1×5 array A through E which sits right outside of my values which are in a 6×5 array. Any suggestions? You use i,j to read through the array but you use different variables to track the output. The code below writes to a sheet called sheet2 starting at cell B2. I would like to know if I can reference an array’ s name by using other variable names concatenated together? No, but you can do a small workaround. You can store arrays in a Dictionary and then use the concatenated string to as the key and the array as the value. Great article on VBA array. I have tested this using 800,000 rows of data and it appears that copy/paste is faster (x5) than simply assigning the values. Here is my test code that shows it’s faster. Please run it and tell me when you think.